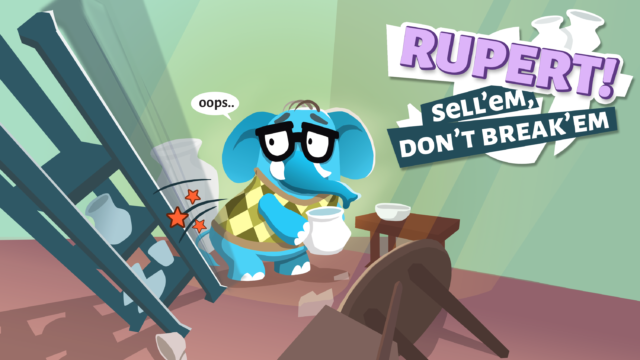 Rupert is a wacky little game made for a charity project that Wooga participated in. It was a total of 6 workdays with 4 people. There were no restrictions, and so it became Rupert: An elephant working in a porcelain store, what could go wrong? You have to help customers find their order, whilst carefully manoeuvring between the shelfs to not break anything. But take too long, and the customers will give bad reviews. A couple of interesting things: The elephant’s animation is all procedural. That is, he’s completely made out of physics joints. We also made a bunch of tools that make it easy to quickly create levels with elements. And finally, the whole game is unlit, but you will see shadows here and there that we “fake” ourselves with some shaders.